Each time all the subroutines are broken on a piece of ice protecting this server, trash the top 2 cards of the stack. 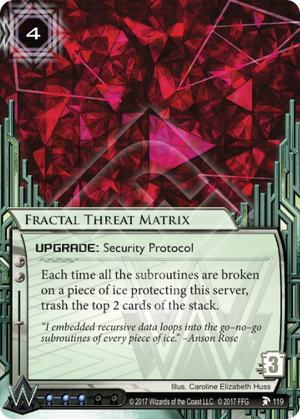 If the Runner encounters a Troll protecting a server with Fractal Threat Matrix, do they trash the top 2 cards of their stack? If Troll's "when encountered" ability ends the run, then the Runner will not have reached step 3.1 of the run and thus will not have had the chance to break any subroutines. If Troll does not end the run, the Runner is considered to have broken all 0 subroutines on Troll, thus triggering Fractal Threat Matrix. The Runner encounters an Ashigaru protecting HQ, and the Corp has Panic Button and Fractal Threat Matrix installed. Each time the Runner breaks all the remaining subroutines on Ashigaru, the Corp uses Panic Button to add another subroutine to Ashigaru. Does Fractal Threat Matrix trigger each tim eht Runner breaks the added subroutines? This could be an interesting card for glacier, if it is indeed going to make a comeback. A 3-deep server would cost the runner 6 cards every time they want in, provided there aren't any subs they can allow to fire. (So this doesn't work great with Archer). Works with Underway Renovation though! I might also try to run this out of Jinteki: Personal Evolution with a pile of 1-pointers and Quandary, Vanilla, Ice Wall, and other cheap ETRs just to see if the accelerated stack destruction is worthwhile. I doubt it would be worth the influence, but it might be entertaining!